Water cooling offers the best cooling performance your computer can get, hands down. However, one of the major things that drive people away from water cooling their rig is the idea that it will be too hard and the stakes are high if a mistake happens. In the past, when custom water cooling was the only option, this may have been true. Now, however, the market is flooded with all in one, or AIO, water coolers. These offer the convenience of simple installation and the assurance of professional quality, but also bring the performance of water cooling. We’ve weeded out the worst ones and picked the five top options to help you find the best AIO water cooler for your needs. If you’re looking for a highly user-friendly and easy to install AIO, then look no further than the NZXT Kraken. 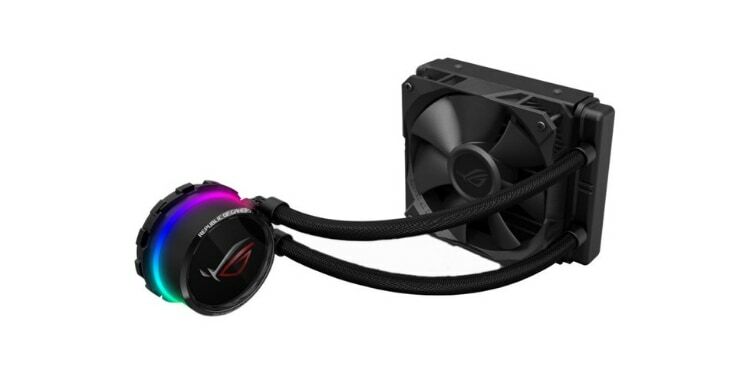 This AIO is very simple to install and is the best AIO cooler for those who are inexperienced with building PCs or water cooling. It comes with a cylindrical water block that is held in place by a simple bracket and a few screws. The water block also has RGB lighting with an infinity mirror embedded in the front to make the lighting pop a bit more. This versatile AIO will fit in almost any build thanks to the availability of pretty much every conceivable radiator size. The socket compatibility changes depending on the specific size you purchase with smaller models offering compatibility with most modern Intel sockets and more AMD options being included with the larger sizes. The radiator thickness also varies by size, with smaller radiators measuring in a bit thicker to offer more cooling in less space. When it comes to performance the Kraken does its job well at all sizes, but can be pretty loud when the fans are running at full blast. No modern PC build is complete without the inclusion of RGB lighting. While most people can agree some lighting in moderation can add a lot to a build, there are some who simply cannot get enough of it. If this sounds like you, then the Thermaltake Floe might be worth looking into. This AIO comes in dual or triple fan configurations and is compatible with a variety of both AMD and Intel sockets. 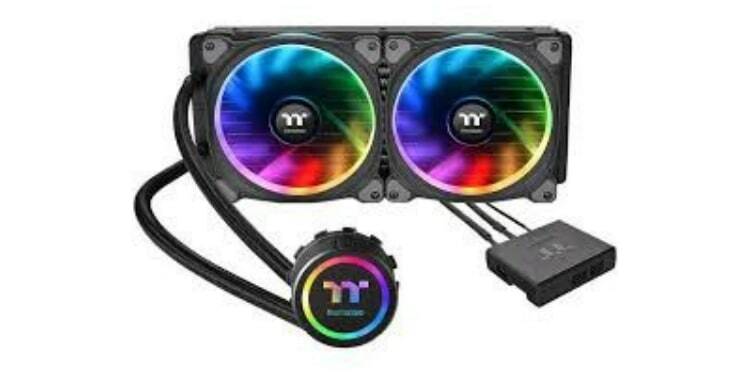 Both sizes come equipped with Thermaltake Riing RGB fans that boast 12 individually addressable RGB zones that let you combine tons of colors and customize your computer’s lighting using the Thermaltake software and the included RGB hub. This is also best 360mm AIO for those looking for quiet performance. Most large radiators produce more noise due to the three fans humming at the same time. However, the Thermaltake Floe still only reaches a maximum noise level of 24.7 dBa even with three fans. The Republic of Gamers, or ROG, brand is a branch of ASUS that typically releases pretty experimental and interesting gaming oriented products. Some of the products flop, but some go on to become respected gaming and PC building tools. One such offering from ROG is the Ryou AIO. This is the best CPU water cooler for those looking to add something unique to their build. On the front of the cooling block is a 1.77” full-color OLED display that can be configured through the ASUS Aura Sync software to display almost anything. From custom logos to real-time temperature stats, this cooler can just about do it all. If that wasn’t enough for you, this is also arguably the best 240mm AIO for those looking for maximum performance, but can’t fit a 360mm radiator into their system. This is thanks to the surprisingly powerful fans that ASUS has included with the radiators. That being said, the cost for all this fan power is that they run pretty loudly under intense loads. If you’re looking to cool something like a media center computer or some other system where noise must be kept to an absolute minimum, then the Corsair H115i is probably your best option. The H115i Pro is the best 280mm AIO for those who want nearly or absolutely silent performance. 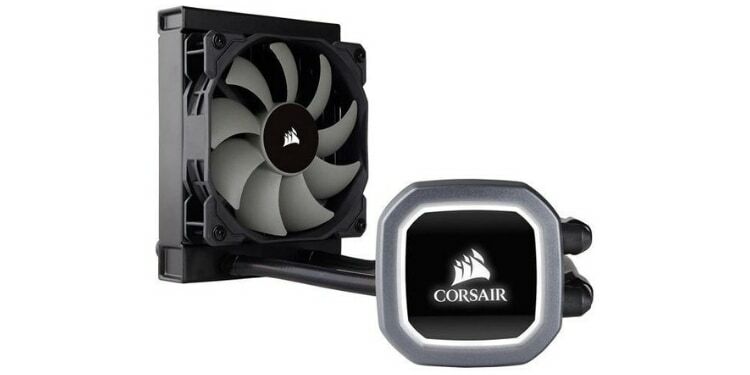 Corsair has used magnetic levitation fans for the H115i Pro. This means that the fans operate with almost no noise due to the reduced friction of not having ball bearings, which is where much of the noise from more traditional fans come from. At maximum blast, these fans only produce a mere 20.4 dBA of sound, which is quiet enough to be completely overlooked and drowned out by the ambient noise of most rooms in the average house. If you want truly silent performance, this AIO does come with a zero RPM mode. This turns the fans completely off and uses the surface area of the thick radiator to cool itself passively. This will reduce performance and offer less cooling than if the fans were running, but offers a truly silent option when cooling your CPU. Many small form factor computers these days are switching to water cooling. This is because AIOs offer significantly better cooling performance for the amount of space they take up, and will always be superior to the short downsized heatsinks that must be used in most small cases. The Corsair H60 is the best 120mm AIO for compact gaming PCs. It features a relatively thin radiator for its size, coming in at only 27mm. Even with the 25mm fans stacked on top, this radiator will still fit into practically any case, including mITX and SFF cases. Water cooling is a complex matter, and to get too in depth into it would be far beyond the scope of this article. (Ironically, brevity and simplification are in the spirit of AIOs.) However, there are a handful of crucial factors that you can look at to get a general idea of how good a given AIO is for your needs. The first thing most people are going to want to consider when shopping for an AIO water cooler is what sizes the radiator is offered in. The radiator is where your cooler will actually dissipate the heat that the water picks up from the CPU, so the bigger this is the better. Although, you will need to make sure your case can fit the radiator size you choose. All else being equal, a 360mm will always offer more cooling than a 240mm radiator, and so on. Generally, larger radiators will also run more quietly most of the time since they are able to dissipate more heat with less airflow thanks to the greater surface area. In almost all cases, 360mm radiators have three fans, 240mm or 280mm radiators will have two fans, and 120mm or 140mm radiators will have one fan. If you’re looking for the AIO with the most options when it comes to size, then check out the NZXT Kraken. Radiator thickness plays a very similar role to size. As long as your case can fit it, a thicker radiator will always perform better than a thinner one due to the greater surface area. 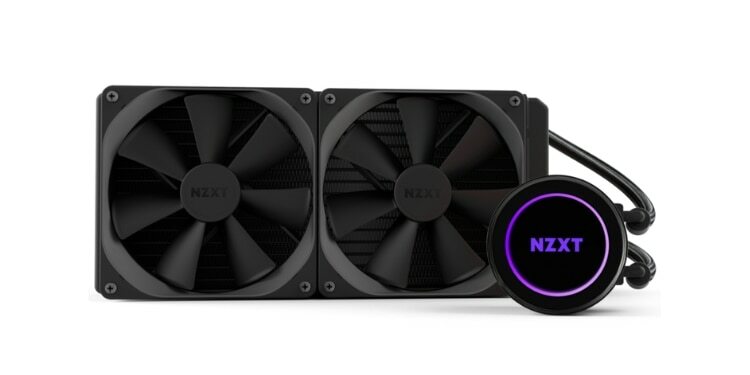 The 120mm NZXT Kraken is actually the thickest radiator on our list coming in at 32mm. Typically, smaller radiators are thicker as a way of making up for having less overall surface area. That being said, almost all the radiators on our list sport a 27mm thick radiator. The only AIO larger than 120mm on our list that has a thicker radiator is the Corsair H115i Pro which has a 29mm thick radiator that comes in either a 240mm, 280mm, or 360mm size. This allows the H115i to offer considerable cooling performance for its size. In addition to superior cooling, one thing many people turn to water cooling for is to reduce the overall noise of their computer. While radiators still have fans on them that will produce noise just like fans on an air-cooled heatsink will, these fans generally need to run at much slower speeds making them quieter. This is thanks to the large surface area of radiators and the efficient heat transfer that water is capable of. 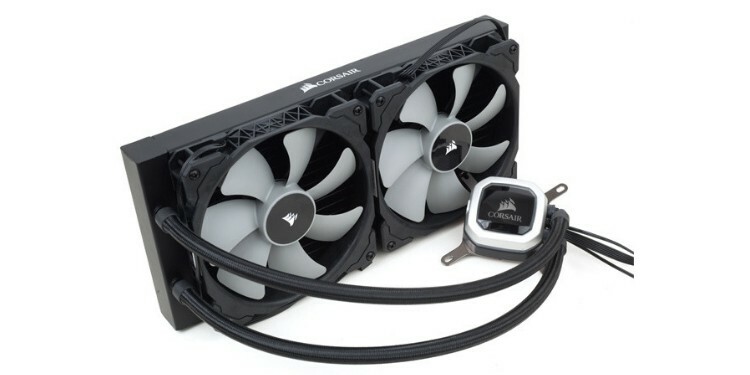 The Corsair H115i Pro is hands down the best AIO for quiet water cooling on the market. It takes full advantage of this fact by offering a zero RPM mode. In this mode, the fans will not run at all, but the pump inside the water block will use the surface area of the radiator to cool your CPU without any airflow. Even with the fans enabled for greater performance, the H115i Pro doesn’t get above 20.4 dBA, which is practically inaudible in most rooms in an urban household.